This homemade granola is super-easy to make and tastes strongly of vanilla and cinnamon. These flavors will provide a much-needed pick-me-up atop yogurt, ice cream, or eaten straight out of hand! Use gluten-free oats and other contaminant-free ingredients to make this for the gluten-intolerant. Preheat oven at 300-degrees. Line a large rimmed baking sheet with aluminum foil or parchment paper. In a large bowl, toss together the oats, pecans, cinnamon, and salt. In another bowl, whisk together the maple syrup, coconut oil, and vanilla extract. Pour the wet ingredients over the dry, and stir well to coat completely. 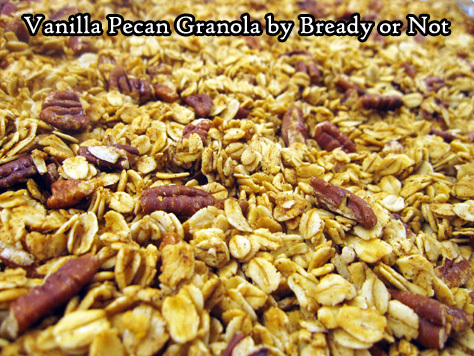 Spread the granola onto the prepared sheet. Bake for 45 minutes, with a pause to stir every 15 minutes. Then let the granola sit out to cool and dry for several hours. Granola will keep for weeks in a sealed container. Can also be frozen for several months.